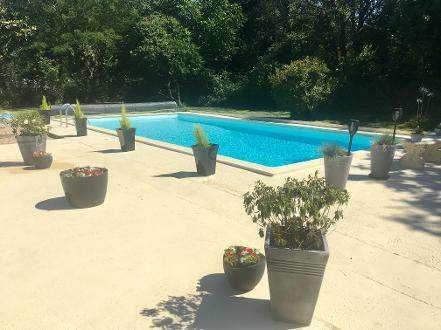 Our 10 m x 5 m swimming pool is a perfect and relaxing spot to chill out amongst the flowers and cool down in the hot summer sunshine. The pool is surrounded by a very large, tranquil sunbathing terrace, and an additional grassy area with shelter should you prefer to get out of the sun. Both the Tobacco Barn and Stonemason's Barn have gated access to the pool area. The pool is also fitted with an alarm for added security. There are lots of sun loungers, parasols, tables and chairs for our guests to use and we have a small selection of 'pool paraphernalia' - woggles, goggles, floats and games - which you can borrow. The pool is available from early May until October (weather dependent). Smoking is strictly NOT permitted on site at all. There is no smoking in any of the gites, nor around the gardens,pool & terrace, nor within our boundary. Children must be supervised at all times, and minors may not have access to the pool and pool area without an adult present. The Tobacco Barn has an outside entertaining area overlooking the pool, a private garden area and access to allocated parking which is gated and secure. 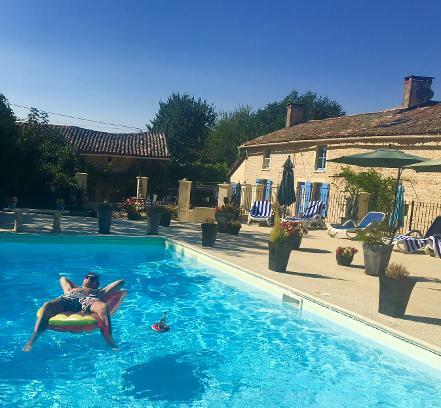 The Stonemason's Barn has a large, private garden with patio, plus a bistro set up which over looks the pool area. Garden furniture is provided for both gîtes. There is a also a communal garden by the pool with large trees offering shady areas. Plus, a huge tournament sized - 17m x 4m - Pétanque (Boules) Court for lazy afternoon competition, French style!